The city of Durban is known for tropical temperatures and beautiful beaches and as one of the only coastlines in the country whereby it won't physically hurt to put a toe in the ocean (kind of kidding, kind of not), it's a popular holiday destination for both South Africans and international tourists. 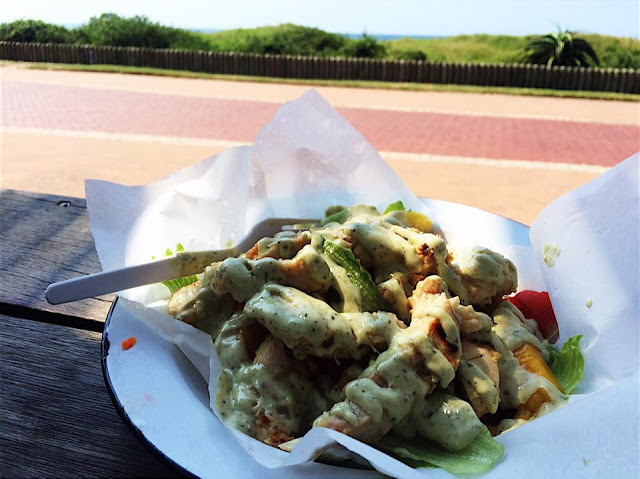 It's not just the beaches though, that bring people in their droves to Durban but the food scene and oh boy, oh boy, oh boy, quite the scene it is! From incredible spicy Indian curries to the infamous bunny chow, the city is renowned for its diverse range of foods on offer and let me tell you, after a week in this place, your jeans might be a little snug but your tummy will be rumbling with pure happiness. Now, Durban isn't the easiest city to navigate around and when I say it isn't easy, it took us around 30 minutes of googling, a walk along the beachfront and an Uber journey...to find a coffee shop with wifi. And I like to think that my Google skills aren't that bad. Named as the number one restaurant in the entire city, Mali’s Indian restaurant is the ultimate place to visit for all your curry dreams (totally a thing) to come true. It looks like, well, in all honesty, not much from the outside and you could definitely be forgiven for walking straight past it however there’s that old peach of saying, ‘never judge a restaurant by its exterior’ (that’s not the saying I hear you cry? Well it is now!) 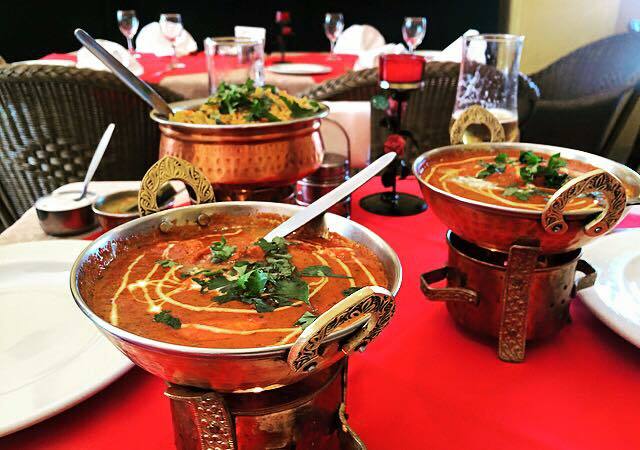 because who needs something to look at when you’re about to indulge your taste buds in the number one Indian dishes in Durban? Not me. I had the butter chicken and holy actual moly, I feel like I can taste it now, my mouth is watering, my eyes are filling u- that could also be because it seems like such a long time since I was there but still! Emotional! The food is utterly stunning, the staff are super friendly and very knowledgeable about each and every dish (my BFF has a nut allergy and they were fab!) and the prices make your eyes buldge, but in the nice way as it’s incredibly affordable for the quality with dishes around?? Basically, you’d be really blooming silly not to check it out. When I asked on Twitter for any recommendations from people #intheknow about places we had to try out in Durban, soooo many people mentioned Afro’s Chicken. Walking one bright mid-morning down the beachfront, in silence and with sunglasses firmly on because damn how bright is it and more importantly, how much did we drink last night, we saw their yellow sign and yep you guessed it, we used being hungover as an excuse to try a-l-l the food and pfft, well done us for drinking too much red wine the previous night because wowza, this chicken is GOOD. There isn’t really much more I can say about chicken, because well, it’s just great and I better not find your little derriere in McDonald’s instead of this place and...just go okay. Also, for those of you who a) don’t like fries (you okay hun?) or b) just fancy something a little lighter, get yourself the chicken and mango salad and thank me later. Do you like bread? Do you like curry? Do you like indulging in food, like a lot? 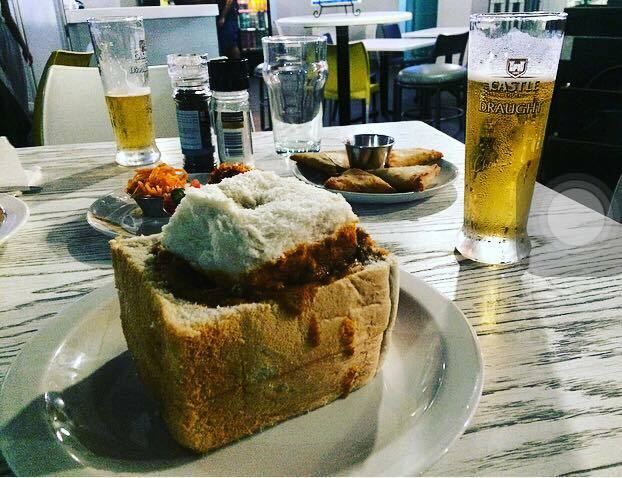 If the answer to these three questions is yes, and actually even if it’s no, pull yourself together because you aren’t missing out on this - you need to try Durban’s infamous dish, bunny chow. Basically, a bunny chow is a hollowed out loaf of bread...with curry in and it is honestly, utterly brilliant and I wish it was acceptable to eat it everyday in winter months because it’s the cosiest, carbiest meal you could wish to indulge in. House of Curries itself isn’t anything particularly special in terms of interiors, think more plastic chairs and tables (although quite a lot of Durban’s cafes and restaurants adopt this approach to seating), but the staff are lovely and the food is great. It’s also on Florida Road so if you’re feeling a drink or 5, that’s the place to be. If you’re wanting a little bit of glitz and glamour, The Chairman is the place to go aka you literally walk down a red carpet to enter the place. We decided to #treatourselves (we say this every time we go out basically but who doesn’t) and got a bottle of fizz accompanied with a Caribbean pizza which were both fabulous however it’s the general ambience and, of course, the stunning jazz music that endears you to this place. Dimly lit with fairy lights in a vintage setting, the environment is luxurious whilst being relaxing and the service is absoltuely out of this world - you definitely feel like an A-lister at this place. Sooooo, there you go - get eating and thank me later! Have you been to Durban? 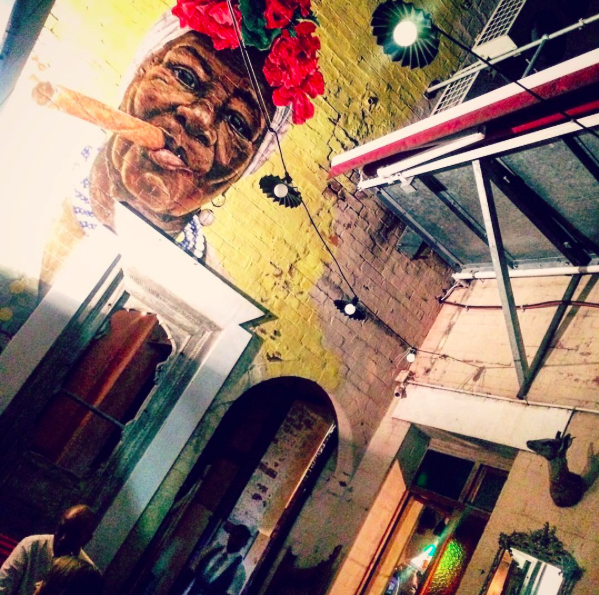 Where are your favourite places to eat and drink? Once you've taken in the unique décor at this venue NYC, the hardest part is to decide whether to go upstairs or downstairs. With a large open floor plan, you'll find bars on both levels, and someone will always come by to serve you matter where you decide to hang out.